Pilots and crew from five airlines launch legal ﻿battles to make cabin air safe to breathe: what is at stake? A new species of dwarf-like human that roamed Southeast Asia more than 50,000 years ago has been unearthed by scientists. Being no taller than four foot, the tiny individuals were capable of climbing trees and walking on two feet. 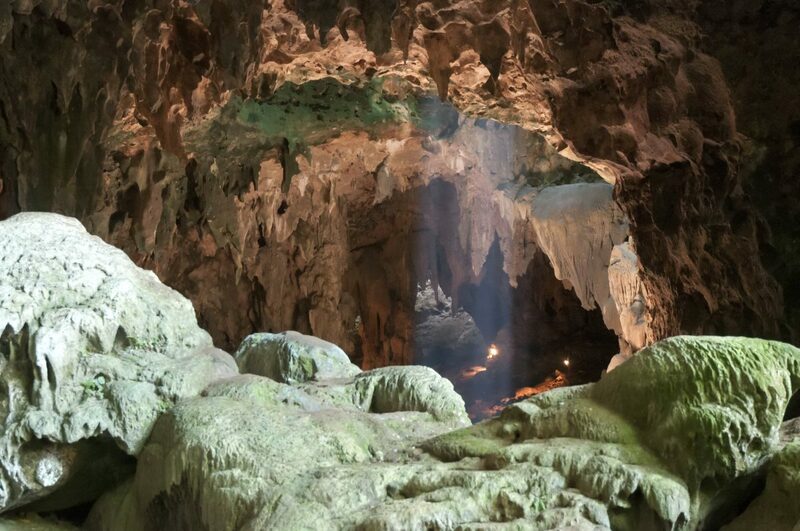 Seven teeth, two hand bones, three foot bones and one thigh bone from at least three tiny individuals were dug out of a cave in the Philippines. They were discovered at the Callao caves near Penablanca, 210 miles north of Manila and named Homo luzonensis after the island of Luzon on which it was found. Early hominins arrived on the island by raft from Africa at a time when experts did not think they were capable of long sea journeys. Stone tools used to butcher meat dating back 700,000 years have previously been found there – along with a 67,000 year-old human bone. This was the third metatarsal from a foot found in 2007 in the same cave. But from which human species it originated had been a puzzle. Corresponding author Dr Florent Detroit, of the Natural History Museum in Paris, said it provided the earliest direct evidence of a human presence in the Philippines. Dr Detroit said: “Analysis of this foot bone suggested that it belonged to the genus Homo, but to which species was unclear. It follows the discovery of Homo floresiensis, dubbed ‘the Hobbit’, on the southern Indonesian island of Flores in 2004. Both were alive at the same time during the Late Pleistocene – sharing the planet with Homo sapiens, the Neanderthals and a mysterious group called the Denisovans. It adds to increasing evidence of a ‘Lord of the Rings’ style world – with some species even interbreeding. Scientists have previously likened it to Middle Earth in the JRR Tolkien fantasy where humans, hobbits, elves, dwarves and orcs lived side-by-side. But the ancestors of Homo luzonensis and the Hobbit may have been isolated on islands where they shrank in size owing to limited resources. They are believed to each be descendants of Homo erectus – the first bipedal human to make it ‘out of Africa’ into Southeast Asia. The former, described in Nature, is believed to have been even smaller – and less robust. It was identified from its unique teeth – such as distinctive premolars. These were a blend of ancient and modern features. When compared with the molars of other hominin species, they are astonishingly small. The simplified surfaces of the crowns loook similar to those of of H. sapiens. Yet the shape of the teeth share similarities with those of H. erectus from Asia. The researchers also used 3D imaging to examine the internal region of the teeth wehere enamel meets a protective layer known as dentine. This was distinct from that of hominins other than H. floresiensis. Homo luzonensis also had an unusually curved big toe – ideal for climbing. The hominin known as Australopithecus afarensis – that lived in Africa 3 million years ago – also had this. Interestingly that species – the most famous skeleton of which is ‘Lucy’ – was also under 4 feet tall and could walk and climb trees. The international team believe Homo luzonensis was also a climber – even though its contemporaries were walking upright and not hanging out in trees. It’s unlikely any DNA has survived in the warm and wet climate. But proteins may have been preserved in the bones. This could shed light on Homo luzonensis’ relationship to other early humans – which are far more diverse than first thought. on the mainland – possibly interbreeding. Homo sapiens is the only living species of a diverse group called hominins – members of the human family tree who are more closely related to each other than they are to chimpanzees and bonobos. Most extinct hominin species are not our direct ancestors, but instead are close relatives with evolutionary histories that took a slightly different path from ours. The new study was published in the journal Nature.